This is my yearly post to prepare for you the Taste of Edmonton which runs July 19 to July 28 downtown at Winston Churchill Square. 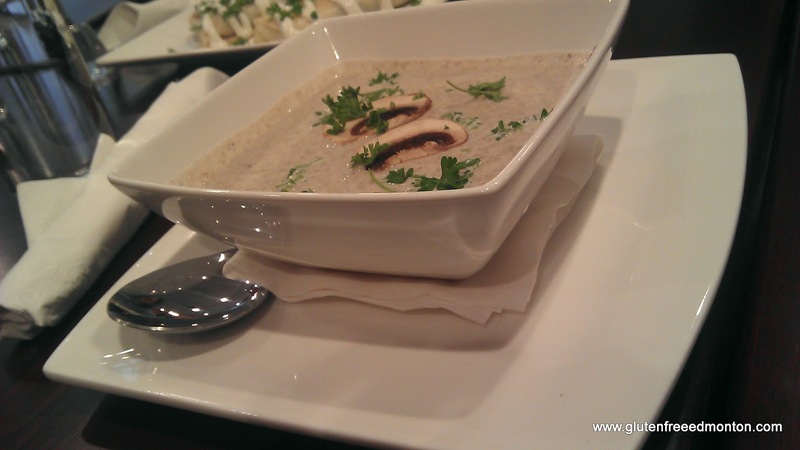 Taste of Edmonton is probably the festival that Celiacs never think they can go to and enjoy. Well, think twice, there has been Celiac friendly options at Taste of Edmonton the past few years. This year will be no different. There are 14 confirmed Celiac friendly gluten free dishes at Taste of Edmonton this year, and possibly more if you ask the right the questions. 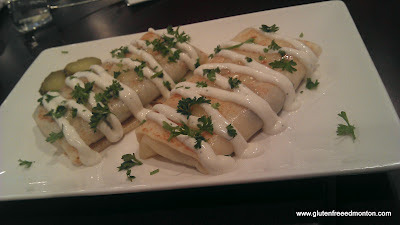 You can check out the Taste of Edmonton menu prior to going. Celiac friendly items are labeled on the menu. Click here for the menu. 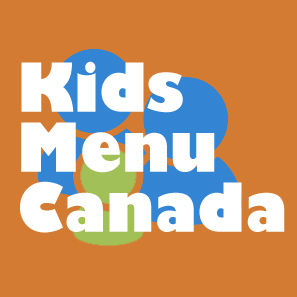 Make sure to check out the menu prior to going and see if there are other foods not labelled Celiac friendly that you can ask about. Call the restaurant prior to going to confirm what foods at their booth are gluten free. It is sometimes too busy and hectic to get a straight answer or it is just temp workers that don't know as much working the booth. Be aware of the higher chance of cross contamination. They are preparing the food in a smaller place. If you are unsure, can't get the answers you are looking for, don't order it! No point in taking a chance. We have heard mixed reviews in the past about the booths at Taste of Edmonton handling gluten free. Some have a fantastic times, enjoy great food, and do not get ill. Some have had quite the opposite. Amanda went last year and checked out a few of the places. I know Amanda followed the rules above. There was one vendor that she knew she could probably eat what was being ordered, but because it was too busy, and the workers seemed to not know 100%, she didn't eat it. Although frustrating, it made her experience better, because she ended up with tasty food from another booth that she enjoyed. So enjoy the 2012 version of Taste of Edmonton and eat safely! This recipe was submitted by Melody. Melody is one of our readers that decided she would like to share this recipe with our users. I thought this was a great idea because we have only shared gluten free pancake mixes, but never a pancake recipe from scratch. I have a gluten-free recipe I’d like to share. This one is Gluten-free pancakes that are delicious and cook great like regular pancakes, but they puff up nice and fluffy when they are turned over. Set your favorite pan or griddle on medium to heat. Mix dry ingredients in a small bowl, set aside. Mix wet ingredients in another small bowl. Add mixed dry ingredients slowly into bowl with an electric mixer on medium until all the mix is gone. Mix for 2 minutes or until nice and smooth. Let this sit for about 2 minutes to thicken. Oil your pan or spray with oil spray. Pour desired amount of pancake onto the hot pan. Turn over pancake when bubbles begin to form. Your pancakes should fluff up real nice once they are turned over. 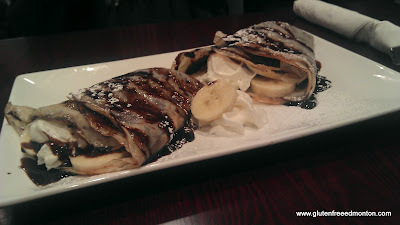 You may add blueberries, chocolate chips or any kind of sliced fruit to the pancake after you pour it onto the pan. This mix makes about 3 medium sized pancakes. I make these for my daughter a lot because she just loves them. I have always loved the Taste of Nature bars. I have tried a variety of their flavors and I'll admit that I do have a few favorites, but of course when offered an opportunity to sample some of these fabulous bars we accepted with big smiles and excitement. For anyone who hasn't tried or heard of Taste of Nature bars here's a little background info on the products they make. Taste of Nature bars contain only natrual ingredients, contain no fillers, no additives, no artificial flavors or chemicals and they are cerfied organic, gluten free (well, the flavors that do not contain oats are gluten free), low glycemic index, vegan, kosher, dairy free, contain no preservatives, low sodium and non-GMO. "Everything you see comes straight from nature". 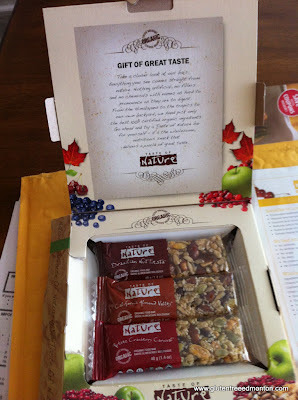 We were sent a fun little gift package of these yummy bars to sample and write about, containing the Brazilian Nut Fiesta, Quebec Cranberry Carnival and California Almond Valley flavors. I have always loved the Quebec Cranberry Carnival the best, but the other two flavors are right up there for my taste buds. Aside of course from the taste, I really love that these bars are made with natural ingredients that I can read and understand and they are not loaded with sugar and other junk that cause blood sugar aggravation...for me these qualities make up a great product. Thanks Taste of Nature and please keep up the great work! Its the 2012 Pancake Breakfast Season in Edmonton! Summer time has arrived in Edmonton, and that means it is Pancake Breakfast season here in Edmonton! Coming from Toronto this was something new to me. Maybe I just was hanging out with the wrong crowds, but Toronto certainly wasn't big on Pancake Breakfasts. But I can tell you, Edmonton loves their Pancake Breakfasts and so do I! 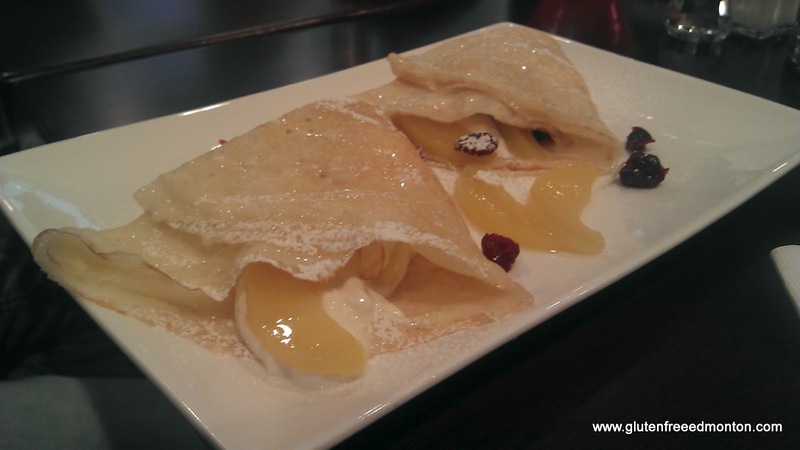 Every year at the Kinnikinnick Store, the Canadian Celiac Association Edmonton Chapter and Kinninnick put on the biggest gluten free pancake breakfast in the city (dare I say in the Country! or even the world). Since Amanda's diagnosis, we haven't missed one. After all, for a small donation, you get a couple perfect giant Kinnikinnick gluten free pancakes, and some treats served up by volunteers and Kinnikinnick staff. This year the big gluten free pancake breakfast will be on July 21st. Don't miss out, this one has been getting bigger and bigger every year, and Kinnikinnick plans on shutting down the street to make more room. For those that haven't tried the Kinnikinnick Pancake Mix, this is a great opportunity to try it out. I can't believe I haven't written about their mix yet, because we buy it by the tub full. They always turn out so tasty, moist and fluffy! You can't go wrong. I serve it to my parents every time they visit from Toronto and they always ask "So whats Amanda going to eat? Do you have a different mix for her?" Always a good laugh. 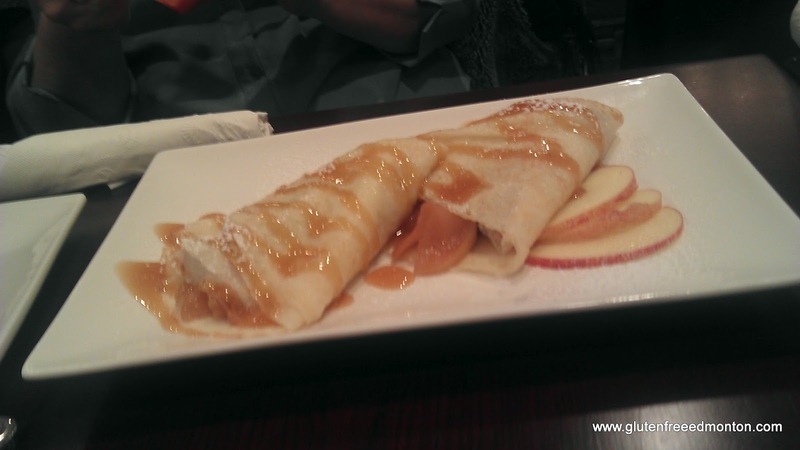 Anyways, there is some more great gluten free pancake news. Last year Kinnikinnick served up gluten free pancakes at Capital Ex pancake breakfast at Churchill Square and they must have had great success because they also added a few more. Way to go Kinnikinnick to spread the gluten free love for the Celiac's! Hope you enjoy and check back just in case Kinnikinnick informs me of more breakfasts they will be supporting in Edmonton. Ed's Gluten Free Store closed its doors on June 17, 2012. Please click here to read the announcement from Ed's via Facebook. We are sad to see this wonderful dedicated gluten free store close its doors and hope Ed continues to be part of the Celiac community in other ways. 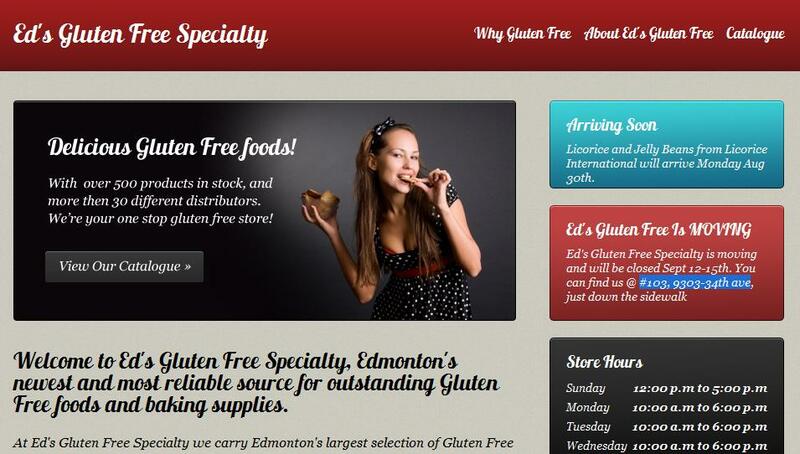 Click here for a full list of where you can shop gluten free in Edmonton. 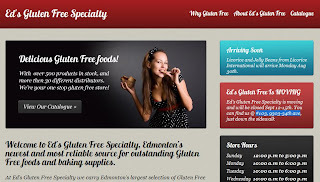 Ed's Gluten Free Store is a fantastic gluten free store to shop at in Edmonton. 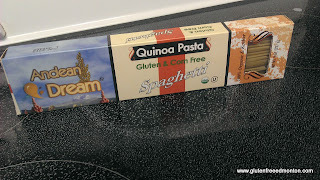 We try to make it out to the store every few weeks to see what type of new gluten free products they have! Feedback from others supports Ed's Gluten Free Store as one of the best places in the city to shop gluten free. They are well equipped with the knowledge about Celiac and gluten free products. They also know the products they have very well and can offer suggestions on what to try. Ed's Gluten Free not only carries the big gluten free brand names such as Kinnikinnick, Glutino and El Peto but also have a wide selection of unique brands not found in regular stores. They also carry fresh pastries and quiches from La Crema Caffe in St. Albert. I also recently learned that Ed's Gluten Free Store is expanding and will be opening up in Vancouver! Have you shopped at Ed's Gluten Free Store? Let us know what you bought and what you thought of the store! I recently invited my girlfriend Laura for dinner in celebration of her 27th birthday. "My friend Lisa is coming into town," she said. "She has Celiac's Disease so everything would have to be gluten free." I promised her it wasn't an issue but wondered if I'd have to spend money on wheat substitutes and cook with reserve like it was my first time. My phone was a source of information at the grocery store as I Googled queries like "do Tostitos Restaurant Style Chips" have gluten? (They don't - hurray!) I appreciated the certainty of labels on packaged goods and the gluten-free section in Safeway. The most informative experience was the dinner itself as I watched Lisa devour every course, use condiments I wasn't sure about and enjoy Betty Crocker Gluten-Free cupcakes which she brought; cupcakes that surprisingly tasted like the real thing. She survived. I survived. Actually, we more than survived; It was a successful dinner party - even for a first time gluten-free chef. Take out your cream cheese a few hours before you want to make it, mix everything in with it and put it in an ovensafe baking dish that will also serve as a serving dish. Sprinkle slivered almonds on top and bake for 20 minutes. I separated the dip into two bowls so she could eat Tostitos and her dip wouldn't be contaminated by crackers. The greek chickpea salad recipe is from right here at Gluten Free Edmonton. The Roasted Potatoes recipes is from Allrecipes.com. The symbol to look for! Yes it's true! The Canadian Celiac Association (Canadian National Office), now has a certification program and Lay's Potato Chips is the first product to be certified! Way to go lays and Pepsi Co! The gluten free certification program will help us, the customer be assured that the product is in fact gluten free and a trusted product of the Canadian Celiac Association. This is great news for the 1% of Canadians that have Celiac Disease. The Canadian Celiac Association however wants you to know that their program can still not guarantee the product to be safe, but allow the consumer to be more confident that the manufacturer has minimized the possibility of gluten contamination. Click here to read more about the gluten free certification program by the Canadian Celiac Association. Read more about which Lay's Potato chips are certified to be gluten free. 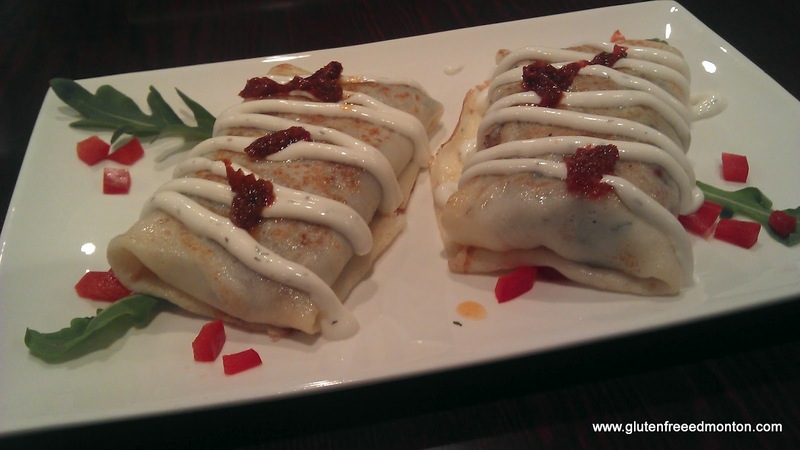 Lately Amanda has been wanting to be adventurous with the recipes we try. She really has been on a binge to try something new, so off she went through our cook books. 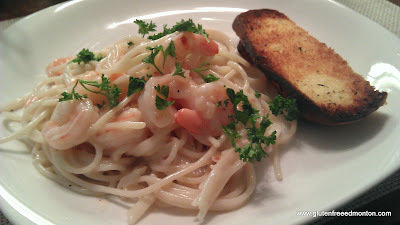 She loves America's Test Kitchen, and wanted to check out America's Test Kitchen Healthy Family Cookbook , and found a Spaghetti with Shrimp, Lemon and Garlic recipe that was easily convertible to gluten free. Looking at the recipe, I knew it was going to be pretty easy to make, and it was! I looked at the ingredients and i was surprised at some of the combinations of ingredients, and was like "really? ", but hey, it works and it tastes great. In a skillet, heat up the olive oil and brown the onions until soft for about 5 minutes. Whisk in chicken broth, clam juice and bay leaf and simmer stirring occasionally for 10 minutes. 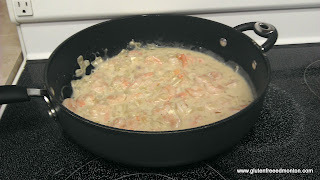 Mix the corn starch with the water until dissolved and add to sauce and simmer for 2 minutes until thick. Stir in shrimp and cook through until pink, or if already cooked just stir in and get ready to serve. While making the sauce, cook your pasta. The pasta should take just as long to cook as the sauce. Mix in sauce and pasta and stir in parsley. Keep some pasta reserved water to loosen up sauce if needed. Want more recipes like this? Click the link below to buy the book. One of our avid readers wrote in about gluten free spring roll she found in Edmonton. We have not tried them yet, but she has been ranting and raving over them saying most of her co-workers order from this wholesale place along with her. They apparently will sell for .22 each with no minimums. We suggest calling in an order, and I am sure bulk orders are appreciated by them. 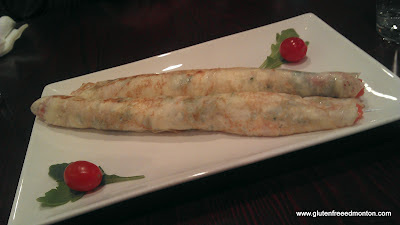 These gluten free spring rolls can now be found at T&T Markets in Edmonton. Signs in the store list it as gluten free. Please be aware that T&T Markets are now owned by Loblaws. Let us know what you think about these. 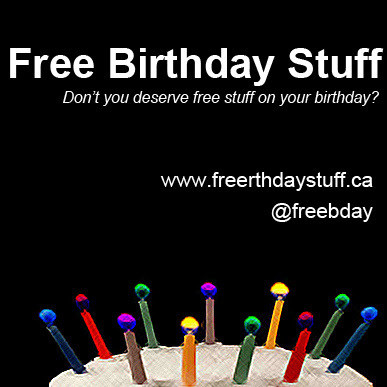 The package is labelled wheat free, gluten free and MSG free. We have written about Kettle Cuisine individual portion, frozen gluten soups in the past. This fabulous company contacted us recently and offered to send us a variety of their awesome soups to sample and share our feedback. As noted in my previous post, I was already a super fan so this was an ideal situation in my eyes. Who wouldn't jump at the chance to sample more flavors of their soups, especially knowing the I already loved their gluten free Chicken Noodle soup. They also make other gluten free soups such as Chicken Chili with White Bean soup, Organic Mushroom and Potato soup, Roasted Vegetable soup, Southwest Chicken and Corn Chowder, and Thai Curry Chicken soup. For those who do not know, Kettle Cuisine "offers ten chef-inspired varieties that are all natural and all gluten free. 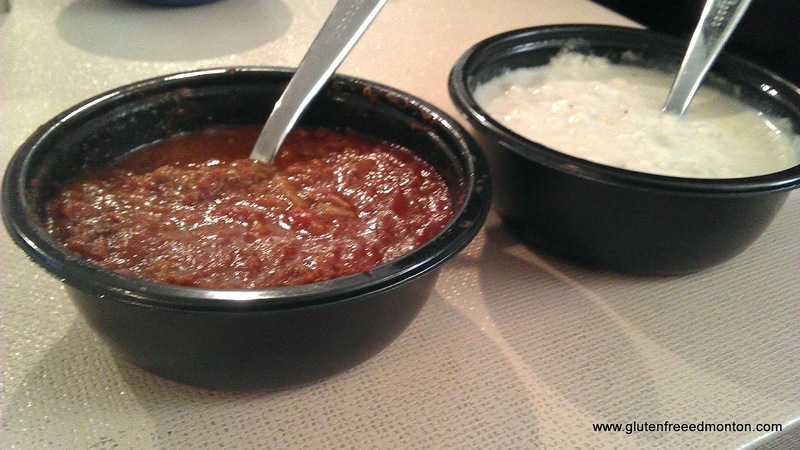 Our soups, chilis, and chowders are available in convenient, single serving bowls and can be found in your grocer's natural food freezer with other healthy frozen meals." 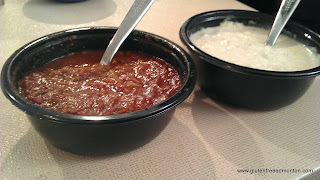 Where can you find Kettle Cuisine? 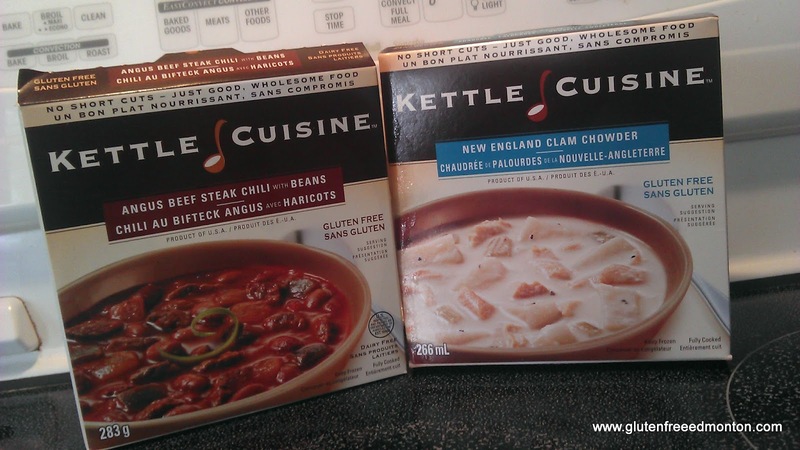 Email us at info@glutenfreeedmonton.com if you find Kettle Cuisine in another store near you.